The raid uncovered a series of health and safety breaches at the Sincil Bank property. Landlords who were fined £30,000 after a raid uncovered multiple health and safety breaches in their overcrowded Lincoln property are to appeal the decision in court today. As reported previously, Balt Properties Ltd, its Managing Director Vytautas Sidlauskas and Manager Valdas Kakta, were each found guilty of 14 offences relating to mismanagement after a raid at 99 Scorer Street on March 9 this year. They were fined a total of £29,090 at Lincoln Magistrates Court in August. 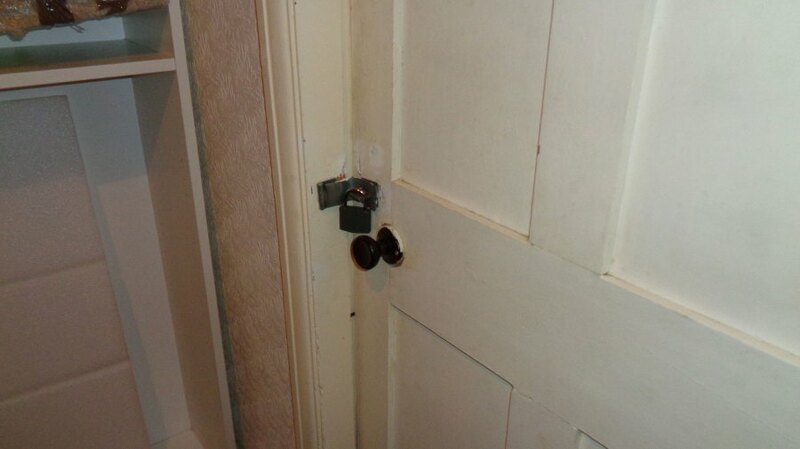 Doors in the property were padlocked from the outside. City of Lincoln Council Housing Enforcement Officers carried out the raid as part of a crackdown on poor quality rental housing in the city, funded by a £96,000 grant from the Department for Communities and Local Government. After initially being denied entry, officers found a raft of serious health and safety breaches, including broken and missing smoke alarms, loose banisters and overcrowding. Eight tenants shared one kitchen and bathroom, while fire escapes were blocked by furniture and doors padlocked from the outside. The total penalty was £31,251, comprising fines totalling £29,090, victim surcharges of £211 and a contribution to the city council’s legal costs awarded in full, totalling £1,500. David King, Rogue Landlords Team Leader, said: “This property has been mismanaged to such a degree it represents a real and present danger to the tenants from numerous hazards: there is inadequate fire safety, an inadequate fire warning system, an inadequate means of escape, inadequate electrical safety, inadequate hygiene and bathing facilities, overcrowding, inadequate food preparation and storage facilities, and tripping and lighting hazards in common areas of the premises. “Taken together, these add up to a dangerous building containing numerous accidents waiting to happen. The defendants were not in attendance at the August hearing. They will appear at Lincoln County Court today to appeal the amount they were fined.